Updated Wednesday December 5, 2018 by Michelle Benczkowski. 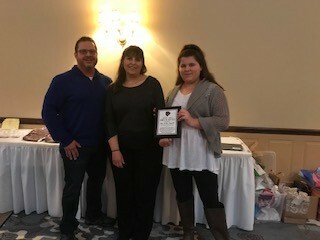 Congratulations to the Foley Family OPLLF and Cheer's 2018 Family of the Year. This award was presented at a recent Cheer Banquet by OPLLF and Cheer President, Dave Zarbo. The Foley's have gone above and beyond the call of duty to be present at games, run concessions, encourage spirit, and embrace all that is amazing about the game and the cheer! We love you and thank you for all you did for us this year!